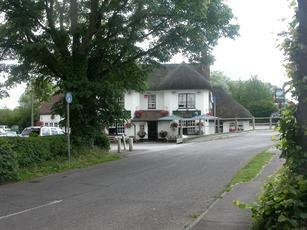 Cracking little pub right next to the river and the A31! Serves wadworth beers - 6x, swordfish, horizon - as well as ringwood best. I had the horizon which was a golden ale. Well kept and tasty and friendly staff. Recommended. As good as previous visit. Well kept and served Ringwood and Wadsworth beers. Welcoming staff. Clean inviting place with real fire. One irritating customer but that's pubs. Food looked very good, all locally sourced apparently. Eaten lunch here many times and never disappointed. Excellent food, lovely old world decor, friendly staff and great beers (London Pride and Ringwood Ales). nothing not to like. I took my family here today (Sunday) for lunch, after the recent refurb. Despite there being a notice on the bar saying they were a chef down and the food may take a while, our starters arrived within 15 minutes and were excellent. For mains we had two roasts and two from the a la carte menu, and again all of them were excellent. This is the first pub I've been to in a long time where the plates were warmed and the food was piping hot. The staff were knowlegeable and very friendly. We spend several minutes admiring the cars in the car park from the Lotus Owners Club. I really rate this place. Go there, you won't be disappointed. My London Pride was excellent, there were 2 other real ales on the handles. We sat in the old part of the pub to the right of the main door, the decor included pictures and memorabilia which contributed to a pleasant and relaxing atmosphere. Service was friendly and efficient, our tomato and basil soups were very good too. Walked round the rest of the pub before leaving, these areas being more of a restaurant, they had also had a sympathetic makeover with pictures and memorabilia. Very popular, you need to get in early for lunch to get your choice of seat. This is one of the few pubs I've visited that doesn't have sticky tables! I'll be back.